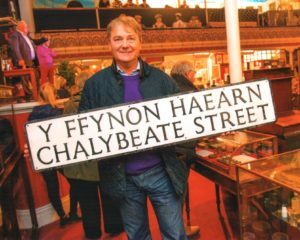 Charles Raw-Rees, Principal of Jim Raw-Rees & Co, Chartered Valuation Surveyors and Estate Agents was very pleased to have acquired the only street sign of Chalybeate Street at a recent auction held by Friends of Ceredigion Museum. Jim Raw-Rees & Co was set up by Charles’s late father in 1948 and is trading from No 1 Chalybeate Street. Charles as a child recalls the street sign fixed to the upper frontage of the building, however it disappeared in the 1970’s. The street sign is bilingual with the Welsh Y Ffynon Hearn over the English. It is interesting to note that in mid-1960’s there was a very famous protest blocking Trefechan Bridge, the main south atrial route into the Town by Cymdeithas Yr Laith Gymraeg over wanting road sings to be bilingual in Wales, which resulted in this happening.